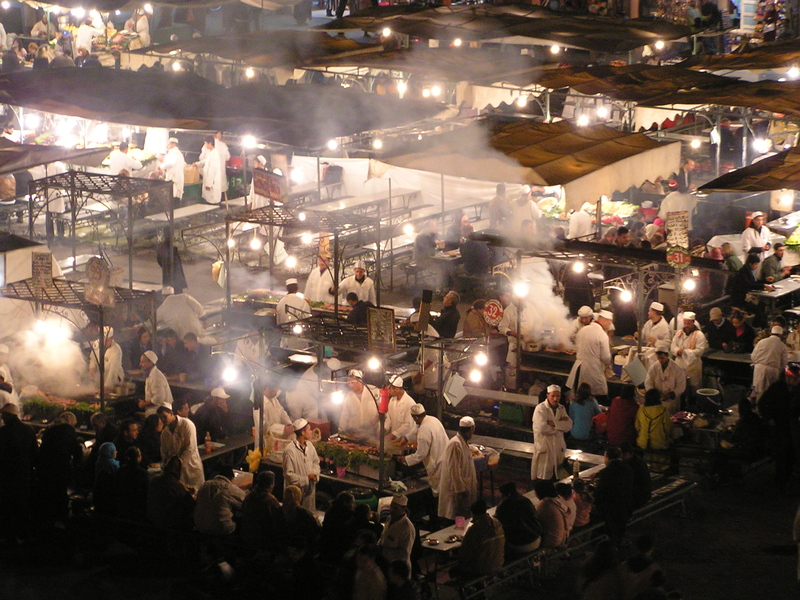 Marrakech is a fascinating mix of old and new, rich and poor, jetset and farmers. Big mansions have shot up around the outskirts of the city, whilst in the medina (old city) families still live in traditional riads – well, if they haven’t been bought up by foreigners turning them into tasteful tourist accommodation. For all you shopaholics, you will go mad! The selection of handmade treasures is divine, from brass lamps to colourful pottery, to funky leather bags, and much more Make sure you get lost in the souq (market) – its not hard and lots of fun! Bargain hard, and whatever you do, don’t ask a price as you are entering into a negotiation and it means you want to buy it. Local shopkeepers will point you in the direction out of the big square if you can’t battle your way out of the maze of shops by yourself. So just dive in! Go to the Artisanale coop for fixed prices if you get tired of haggling. This is on Mohamed V Avenue, heading towards Gueliz. You can look at handicrafts in peace and pay reasonable-ish prices. If you feel like hanging out with the upper class/jetset and taste of bit of “Afro-Arabe”, go to Gueliz, the “Paris” of Marrakech, and hang out in the cafes there. Don’t hit the roof when you get your bill for your coffee, you have been warned. However the people-watching is world class, so consider yourself having paid for entertainment with your coffee. There is quite good shopping also, with labels like Zara and a wonderful local label Marwa. 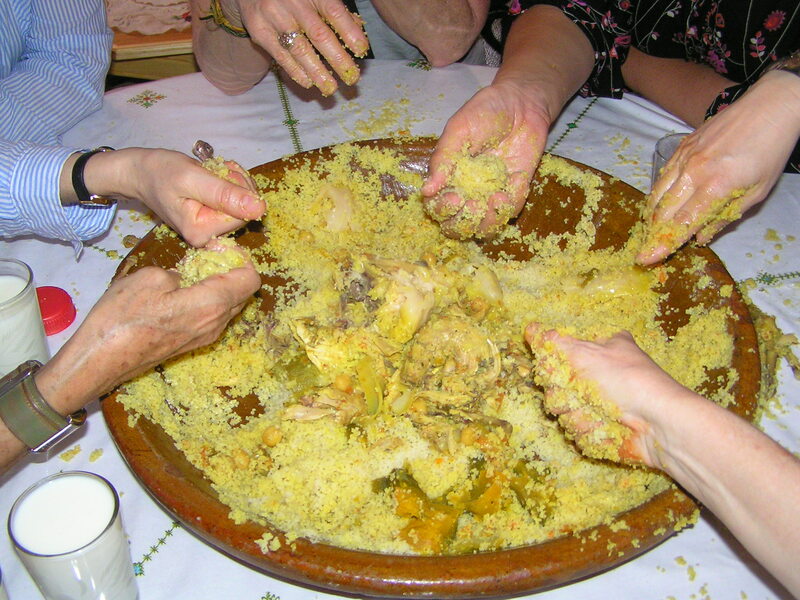 You might find you get “Tajined out” – too many restaurants serve “tourist food” – tajines, couscous, Moroccan salad – try to find a restaurant that serves a variety of so-called “salads” – these are small warm or cold dishes that are sooo tasty! Everything from babaganou (egg plant), hummus, beetroot salads, etc etc all spiced Moroccan style and will rock your socks off. 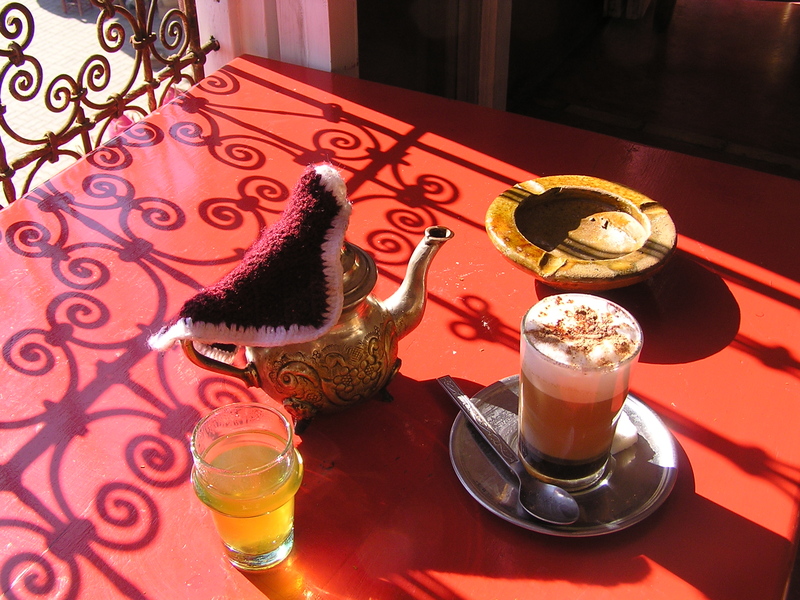 Café Arabe – immerse yourself in a vivid and magical, enchanting and charming atmosphere. In the medina of Marrakech, with Italian and Moroccan cuisine. Make yourself comfortable in one of the lounges, in the court or on the terrace … you will be right at home. Don’t forget to eat on the big square (Djmaa Efnaa) – this is a MUST – great fun and bustling atmosphere – try the spiced tea stall, and if you see the ladies selling macaroons, they are addictive, beware! -Juice bars – walking along the streets, you will see little shops with fruit hanging in the doorway – these are juice bars. 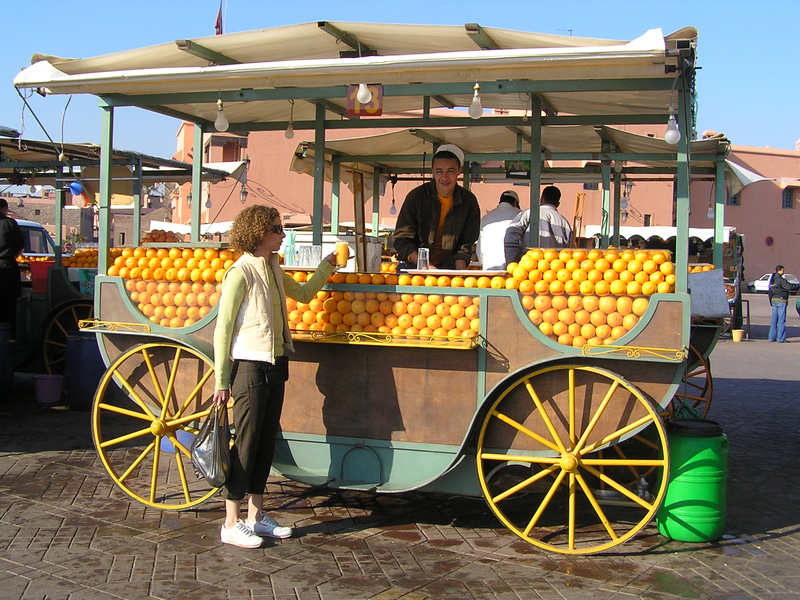 Order yourself a fresh juice to give yourself a shot of vitamins to keep you going in the souq. Try the avocado juice (avocado, milk, sugar) or the almond milk (Lait Almande) – delicious! Also you can buy a glass of vitamin C-packed fresh orange juice on the big square cheap as chips – great on those hot days! The Tazi – if you want a cold beer, this place is an institution in the medina. As far as I know it was the first and (used to be only) place selling beer in the holy medina. A mix of clientele, easy to find and a good place to meet people and people watch. -Marrakech is hectic. Take some time out strolling around one of the many gardens. There is a rose garden behind the Kotoubia (big mosque opposite the square) Further along the road towards Gueliz is the Cyber Parc, also a nice retreat. -want a henna tattoo? You could get ripped off on the big square by the henna ladies (bargain hard and don’t pay full price if its not good) OR go to the Henna Cafe, which is a community project providing professional clean Henna tattoos by local women with 100% of profits going to those in need in Marrakech. The Henna Café charity was set up in2011 by 4 UK business people who wanted to give back to Morocco and Marrakech. It’s good to give back! -definitley go to a hammam to see what the girls do – if you have time and enough dead skin, try a local one and a tourist one for a comparison. The local one is a genuine, authentic experience – you will get soaped up, scrubbed down and given a rough massage on the floor. In a tourist one (I recommend Zianis) you will get pampered, scrubbed, and massaged with argane oil. Whatever you choose, you will come out pink as a new born baby and cleaner than you ever were in your life! – always make sure the meter is working in the taxi – unless you know exactly where you’re going and the price, then you can haggle with the driver. Taxi drivers love to rip you off in Marrakech.. Most of the time you should not really be paying more than Dh15 or you are getting ripped off. -Dress conservatively. You will see lots of tourists fresh off the plane enjoying the sunshine in skimpy shorts and tank tops. Not good. Cover your shoulders, wear long sleeves, long pants or skirts below the knee are best. You do not need any more attention than you are already going to get as a female and a tourist, and dressing “like a hussy” reflects badly on you and your family. You will be much better received if you dress respectfully, ESPECIALLY important during the month of Ramadan when men are trying to have pure thoughts during the day – don’t distract them! -Crossing the street is not as bad as it looks – trust me! Just cross through the throngs of on-coming cars, they will stop and let you through with a smile. Locals will let you use them as a human shield too, and will often help you. Be confident, once you have done it a couple of times, you will be fine. -Change is hard to come by, when you get some hoard it for when you need it. Keep small coins and bills (Dh5 and under) for change and tips. You will need to tip often – Moroccans earn very little – look it as your way of making someone’s life a little better, rather than just as a payment for service. -When asking for directions, always ask at least 3 people unless the first person you asked seemed really sure. The first one you asked might not have known the way, but they often just tell you something because they don’t want to let you down. Don’t waste your time being lost and angry because you believed the first person. -plonkers: if you find yourself getting followed around by time-wasting plonkers who just want to practice their English or generally bug you distracting you from looking around and being with your own thoughts. Feel free to politely tell them you want to be left alone. -Travelling independently you will be able to take buses and where possible I recommend taking the train (always take some food to share with others as they will share theirs with you, it is the Muslim way). Some places are quite far out of the way and you will need to do a tour or hire a vehicle to get to them. If you do go independently, what you do have to look out for is this: the tourist information centres are often not that great (read “terrible”), and getting information from a trustworthy source can be hard. There are a lot of tiny travel agents desperate for business with touts on the street to lure you into their shop. At least have a guidebook to get some recommendations (if you don’t do a custom trip). In some places it is worth having a guide, eg Fes, although even here you have to be careful if you organise one yourself as they often just want to take you shopping, and if they find you don’t want to shop, they will lose interest in you! Friends of mine were even ditched by their guide in Fes because they didn’t want to shop. This is one of my favourite books on life in a Muslim culture – read it for an insightful and amusing journey in Morocco! Lovely article on becoming friends with Marrakech–a lovely positive attitude. We also have a fair bit of information on how to enjoy Marrakech, places to go, best way to get around, etc.